Since she was little, and even to this day, Inferno believed herself to be destined for greatness. A dragon that would fight better than any other. One that the queen herself would be proud to name as a FireWing soldier, or even a Sentinel for that matter. And yet, here she was. Caught behaving much the same way dragonets of her age were expected to behave. Chasing field mice in a meadow on a dim afternoon. She’d captured, roasted, and eaten a few already, but the bored young dragon was simply biding her time until nightfall. Rumor had it that there was something mystical about this meadow when the stars came out. That there was some sort of hidden treasure that would only reveal itself when darkness befell the land. A treasure so valuable that it would allow for a poor dragon to live out the rest of their life in aristocracy. While gold and money were appreciated, what Inferno really wanted was an all-powerful weapon. Something that she could use to overthrow all of her enemies. Even if that wasn’t what she would find that night, her contingency was that she would obtain enough currency to then buy her dream weapon. Maybe even something that could kill an EarthWing...that’d be great! Inferno thought. After chasing another mouse until it scurried back into the safety of its burrow, the dragonet sat down in the middle of the flowery meadow. The tall grass reached halfway up her body, concealing her tail which was currently wrapped around her front talons. The sun was still setting off in the distance, the light of it dancing off of her amber eyes while her scales complimented the orange horizon. She glared at the sun as if to match its intensity. As if she could make the burning ball of gas go down even faster through sheer willpower. At the moment, Inferno hoped she wouldn’t die from boredom before having a chance to even look for her treasure. During the middle of Aviur's thrashing, a pair of strong talons latched onto his shoulders, stopping him mid-scream from shock. He stared into the face of Temur as he told him to calm down, only registering his words as the dark dragon said Inferno was safe and alive. He relaxed, closing his eyes as a warm sigh of relief escaped his jaws, coming out in a hot breath of steam. He found himself chuckling at Temur's mention of her temper. "Mmhmm. She tried to strangle me once," he said, remembering when she had called him a worm and shoved him against the side of the tunnel. As the last of the tingles of shock left Aviur's body and his mind cleared, he remembered his death. "W-Wait.." he said. He looked over his crimson shoulder and opened his sail. The flames shot upwards and crackled happily. Bewilderment was the expression Aviur wore, his jaw hanging open and his yellow eyes wide. "B-But.. m-my life source flames! They went out while I was-" He then remembered Inferno was a FireWing. Had she shared her heat with him somehow? She had saved his life. Aviur looked up, mind blank, at Temur as he scooted back a bit, wearing a happy expression. He raised a brow. "You look happy," he commented, smiling gently. Anxiety ripped away his smile as Temur mentioned Inferno had been gone for a little while, but then he remembered: Inferno was tough. Tougher then him. Tough enough to do anything. The idea of Inferno being delighted to see him sent Aviur's cheeks going red. He was grateful for his crimson scales, all of a sudden. He grinned. "I'll be delighted to see her too," he said, deciding to leave out the part that she was the only friend he had. The grin faded when he heard that Inferno had been crying over him. Aviur's eyes widened and his head raised as a pained and upset look came onto his face. "Oh.." he said softly. The last part almost made him laugh, about her telling Temur not to tell Aviur. A second later, music to Aviur's ears came in the form of Inferno's angry voice. He started smiling at her outraged attitude, and that smile turned to a childish grin when she walked in. He expected an,"Oh, you're up," or a, "What in the name of the gods were you doing back there?!" because Inferno was never one to show that much emotion except when she was angry. He didn't expect her to hug him. Aviur didn't hesitate, he hugged her back immediately, holding her tight with his wings. Inferno pulled away, and he grinned. "It'll take a lot more then my Life Source Flames going out to bring down this awesome dragon," he boasted playfully. He smirked when Inferno's expression changed and became one of embarrassment, then one of anger. That image was going to become his new random laugh joke. Temur's intervention was swiftly put to a stop by Inferno's glare. If looks could kill, Temur probably would have exploded on the spot. "You were saying, sleepy Kitten?" he teased, sticking out his tongue at Inferno in that cheeky way he always did. Her words regarding the treasure made Aviur's heart sink a little, but then his fading smirk of cheekiness became smile as Inferno mentioned the ring she'd lost. "You look pretty without it, don't worry," he complemented, trying to play it arrogant and confident. "Regarding the treasure," he said, tilting his head as he grinned boyishly at her. "You must be blind, because I can see the treasure right in front of me." Okay, not cool. ABORT! ABORT! Aviur awaited the slap in the face he was going to get, or the sarcastic reply that would be as equally painful a slap to the face. He kept the 'confident' smirk on his face. He'd said it, and he really hoped she just took it as teasing, or as him being playfully flirtatious. His whole face was burning. There was a long moment of silence. Temur didn’t look all that bothered by Aviur’s compliment to the dragoness. Inferno, however, was furious. She stared at him with spiteful focus, like she was trying to flay him alive with her eyes. Inferno glared at the other dragonet for a moment longer before turning her attention to the EbonWing. Some of the anger drained from her face and she looked up thoughtfully. “Of course, my apologies,” the large dragon bowed his head respectfully. “Despite my eagerness to pass on, I feel it might be easier if one of you two smashed it instead.” He held out the amulet and Inferno instinctively took it into her talons. The look on her face told that she wasn’t going to let Aviur get away with that statement of his. Not for a long time. He stood there frozen as he watched in awe at her expression. He saw nothing short of disgust on her face, almost hatred, as her face reddened with anger. Her words were like wasp stings, jabbing at his heart over and over again. His legs refused to move, too shocked, too embarrassed at her reaction after his slip up. This is the dragoness who he loved, yet he was being chased from her heart like he was a nobody and for the first time in his life he understood what it felt like - mortification. "I was just cleverly referring to the jewelry," he said, holding his paws up in mock defense, acting as if he wasn't mad or hurt at all. Then again, of course no dragons could fall in love after a few hours. They barely knew anything about each other! Aviur didn't even know her favorite color! He just wanted to curl up and die there and then. Thankfully, Temur stepped in, allowing Aviur to die without Inferno looking at him. Small matter of his amulet? Not realizing Inferno was still looking at him, Aviur face palmed, then paid attention, teeth clenched. He listened as Inferno and Temur exchanged words, the realization that this would be goodbye for Temur hitting Aviur like a kick full force in the face. He swallowed. Why did he care so much for one male? Maybe because he had no friends until now. Rising, Aviur's legs felt like jelly. He looked at her, before taking it off her silently. He avoided her gaze as he turned towards Temur and shakily stepped towards him. Once he was in front of him he cleared his throat, anxiety in his eyes. Truth was, he'd never killed someone before. "Thank you. You know, for.. everything," Aviur offered him a small smile, before he raised the amulet. When you kill someone, you look them in the eye. Aviur threw the amulet to the ground as hard as he could, and the sound of shattering glass-like material filled his ears. He heard the stuff spraying over the ground, and his whole world went cold. Was this what it felt like? Taking a life? The cold rushes into your veins and digs into your organs without mercy? He knew now. The answer was a yes. Why did he look so nervous? Inferno was confused since, once again, Aviur hardly knew the other male. She would have expected him to just smash the amulet and get it over with. It's not like he really helped us anyway. All he did was point out Cor was going to betray me. He didn't even KILL that disgusting cannibal! Inferno thought. It was at that moment that the dragoness remembered how she felt after her first kill...or more accurately, what she thought was her first kill. An old FireWing named Emberwood who nearly died because of an accident that the she herself had caused. The memory of how she felt that day came flooding back. Shock, denial, guilt...but most of all, fear. It didn’t feel good, but was it really supposed to? In her life, Inferno intended to kill many dragons that got in her way. Her only hope was that it got easier the more times she’d done it. Part of her was regretting giving Aviur the amulet, but perhaps this was something he needed to do just as much as she did. Temur nodded as the dragonet thanked him, then drew in a deep breath. He, too, looked nervous. A dragon excitedly waiting for his own demise. “I’ll be sure to do that,” the large dragon assured. With that, Aviur raised the amulet high and shattered it against the ground. As it broke apart, a ball of soft light was released. It floated toward temur like a ghostly spectre, before disappearing inside of his chest. Temur clutched the spot it had gone into, wincing and growling in pain. He raised his talons up, holding them in front of his eyes as they quickly began dissolving into ash. In a matter of seconds, his whole body began to do the same. Temur didn’t speak a word. The only noise he made was the occasional grunts and hisses during this painful process. He laid down, covering himself with his wings as he tried to cope with what was happening to his form. Then, just like that, he was gone. Reduced to a pile of dust. Inferno couldn’t take her eyes off of him the whole time. It wasn’t exactly as clean and majestic as she’d imagined it, but nevertheless, the deed was done. Temur was free from this place. “Well…” the dragoness said, slowly making her way across the room and grabbing a small pouch. “I guess he won’t be needing this anymore, and he’d probably appreciate it if we didn’t break it.” She reached in and pulled out another amulet, this one as red as Inferno’s scales. If he didn’t, it didn’t take long for the intensity of the earthquake to become unmistakeable. The ground was shaking, and by the sounds of it, stone was falling outside. Regardless of whether or not he moved, she forcefully yanked him behind her, dragging him outside just as the building collapsed in on itself. Upon exiting, she looked around and saw that buildings all around them were toppling. Staying on the ground would likely become a deathtrap before too long. Looking up, however, Inferno’s eyes grew wide. The top of Stone Haven was beginning to disintegrate. Large chunks of stone raining down as streams of dirt flowed through with ease. The whole city was falling apart. Inferno and Aviur were caught right in the middle of it. As Aviur raised the amulet, he heard Inferno speak. PassionFire? Huh. Whose that? The FireWing wondered, but pushed the thought to the back of his mind as he smashed the amulet. The sound of shattering glass filled the air, and before Aviur's eyes, Temur started to just.. dissolve.. into ash. He watched, horrified and amazed, as the dragon disappeared, leaving behind only his ashes. Aviur stood there, frozen. He had just killed a dragon. The weight of the deed fell on his shoulders and he stumbled. Using a wall to steady himself, Aviur rubbed his forehead with his wing, sighing softly. Temur had wanted death. He had wanted freedom. He had done the right thing. Right? Aviur looked up as Inferno walked over to the pouch and picked it up. He said nothing. There were so many emotions flying around his brain he didn't have the time or the patience to try and categorize them. "Hear what?" Aviur asked, his eyes widening as dread pooled into their expression. Then, the ground began to shake. Frozen, Aviur was unable to move until Inferno yanked him outside. Yelping, Aviur spun around to see the forge collapse in on itself. Letting out a breath he hadn't known he'd been holding, he looked up, and gasped. Aviur's jaw dropped open as he saw Stone Haven's vast roof beginning to topple, dirt and stone heading towards them at an incredible pace and gaining fast, as the buildings around them began to fall. "Do you think we can fly up and find the tunnel we dropped through?" he asked, starting to grin. "Because I'd love a shot of flying through those rocks." There was something about the grin on Aviur's face that excited Inferno. He looked so daring whenever he did it, yet so far what followed afterwards was usually something that peeved her. This time, however, he brought up a good point. Flying back the way they came was their best and only option. This wasn’t going to be easy, though. If the tunnel wasn't already caved in, then it was likely going to be soon. On top of that, the cramped space would make it a little hard to fly. The dragoness imagined they'd need to use their wings and talons to escape fast enough. Nodding her head and returning the grin that he’d flashed her, Inferno launched herself into the air. She flew up toward where they'd fallen through, or at least, where she remembered them falling through. She was hopeful that they’d find it before getting buried alive or crushed by stone. A sudden loud crack practically deafened the dragoness, leaving an unpleasant ringing in her ears. Looking to her left, Inferno caught a glimpse of the giant glowing orb that illuminated the city just as it came crashing down. In an instant, everything was pitch black. Inferno panicked, unable to see her own talons in front of her face. How in the world were they supposed to find their tunnel without any light? She felt a small abrupt wind wash over her, telling her that she had been eerily close to a plummeting chunk of debris. The horrifying realization crept up on her that now they wouldn’t even be able to see anything that was going to fall on them. Perhaps this was comparable to flying quickly through a forest with a blindfold on. The dragoness tried to think back to when she’d last broken a mirror, just so there could be some reason for the plethora of bad luck she’d been having lately. Inferno looked up, squinting hard to try and see through the darkness. Even though her eyes would never adjust in time, there was a slight glint. A shimmering bit of light that flickered in and out like a blinking star. Could that have been their tunnel? Having no better ideas, Inferno let out a cloud of fire from her maw. Without waiting for a response from him, she began flying up and up and up. Every so often, a rock would strike her wing and make her falter from the pain. Each time, however, she regained her balance and kept going, letting out small blasts of fire in tempo with her breathing. Inferno hoped with all her heart that Aviur was following her. “Come on…” the dragoness murmured. The light was getting closer and closer. Before she knew it, she nearly collided headfirst into the top of the giant dome. She blindly felt around and discovered what had to have been the opening to their tunnel. Hesisting for only the briefest of moments, she let out another puff of flame before climbing in and frantically scrambling upward. Her wings ensured she didn’t lose any progress as loose dirt crumbled downward. Sorry, Avi, she thought. Provided that he’d made it into the tunnel with her, she could very well have been throwing a lot of dirt into his face. I promise to make it up to you if we survive this. The light at the end of the tunnel was getting bigger and brighter. It wasn’t long until Inferno could make out the blue skies of Pyrria. In just a few more seconds, the dragoness burst through the hole and flew high above the ground. Everything, from the crisp cool air to the natural sunlight. It was all so...beautiful. Even Inferno couldn’t deny how free she felt. It was like the world itself was a gift to her, and she was now able to explore the farthest reaches. The only other time the dragoness felt like this was when she first learned how to fly. Looking back down, Inferno saw that the ground was breathing. It crumbled down, making a large crater in the earth as it buried the remains of Stone Haven. The only history that remained of the city now resided in the minds of two FireWing dragonets. Such a thought made the dragoness’ head dart around, trying to ensure that Aviur had made it out with her. Something about the way Inferno grinned sent tingled up Aviur's spine. He hastily reminded himself that he barely knew her as a dragoness, and tried to push the feelings out of his head as he launched himself into the air. The wind whooshing by him felt soo good. Yet it wasn't the same as darting through the trees at sixty miles an hour. Aviur couldn't wait to be out of here. If he believed hard enough, would they make it out of here? Aviur didn't doubt it for a second. He closed his eyes, grinning as he spun like a ballerina, waiting for the rocks to come down to them. A loud crack sent Aviur's head ringing, and when he looked to the right, he saw the glowing orb falling towards the ground. His eyes widened, and then everything was pitch black, and he was deaf. Blind and deaf. In a situation like this? Heeeell no! He flew, his world silent as the moon on a quiet night. Nothing but pitch black. A rock hit his wing, and Aviur shrieked, but he didn't know he'd shrieked. He just felt the air rushing from his lungs. Aviur cried out as a rock pelted his other wing, and dodged to the side. He was lucky. He didn't see it, but the little rocks had been a part of a huge chunk of the roof, coming right down on top of him. Aviur was blind for a moment longer, before he saw a blast of orange flame up above. It illuminated Inferno's face, and Aviur felt comfort in the fact that his companion was still alive. He didnt hear her, but he got the message as the flames illuminated the tunnel they'd came through. Aviur followed his memory and his instincts on sensing in the dark, and suddenly he found himself in the tunnel. Aviur saw light. The light drew bigger as the rumbling drew louder in his ears. Hope seeped into his mind and heart, and as his hearing began to return more, he could hear his own breathing very faintly, and the sound of his wings beating and his claws hitting the hard, packed earth. And with a gasp, he emerged into the light. Stretching his wings properly, Aviur flew a good fifteen feet into the air, before he looked down as he hovered in the air. He could hear again. Thank Arkhor himself. Aviur's brilliant yellow eyes widened as the ground groaned, before letting out it's last breath as it collapsrd in to itself, creating a crator that now buried what was left of Stone Haven. It was gone. Releasing a breath he didn't know he'd been holding, Aviur looked around for Inferno. Spotting her close by, he flew over to her. "You okay?" his own voice was a sweet melody to hear. Inferno’s head whipped around as she heard the other dragonet’s voice. The knot in her stomach untangled itself, while the feeling of excitement came rushing into her mind like water from a broken dam. “Am I okay?” she repeated. “I’m more than okay! I’m amazing! You’re amazing! I can’t believe we survived all of that!” Inferno putting her joy on such a display was rare, but then again, the adrenaline she felt at the moment had been stronger than ever before. Another wave of excitement rushed over the dragoness. There was an uncontainable giddiness in her chest that made her want to explode. She had to refrain from shooting a blast of fire in the air. “I feel like we can conquer anything after all of that. Like we’re invincible!” Inferno grabbed Aviur’s arm roughly. “You know what? Considering how much we had to endure, I think I’ve earned this.” She pulled him toward her, then pressed her maw against his. Aviur laughed at Inferno's response, nodding madly. "Me neither!" he exclaimed as he did a back flip. His wings were sore from being hit by rocks, now that the adrenaline had worn off, but he didn't care. Pain reminded you that you were alive. Inferno's excitement was infectious, making him jumpy and giddy. He listened as she summarized their adventure, the biggest grin on his crimson face. "Oh, and don't forget that I, the valiant hero, saved your tail," he said, putting on a 'high and mighty' tone of voice as he chuckled. Aviur had never felt this excited before. Ever. It was a new, strange, and wonderful feeling of feeling alive. "Mmhmm!" his grin widened at Inferno's comment about them being invincible. He paused as he opened his mouth to add on to that sentence when she grabbed his front leg, or arm. His brow furrowed in questioning, as he tilted his head. "Huh?" he said dumbly in response to her words, and suddenly Inferno was kissing him. His eyes widened, before he closed them and smiled into it, feeling his face grow unnaturally hot. He opened his sail and his life source flames soared higher then ever, a burning beacon. It took a few seconds into the kiss for Inferno to realize exactly what she’d done. Her expression melted into one of shock as she pulled away, separating their maws before they got any more intimate. Embarrassment practically consumed her, making her feel clammy and weak. “Wow,” the FireWing dragoness said, “uh...sorry about that. It was kind of spur of the moment. I think the adrenaline must be getting to my head.” She averted her eyes and noticed herself falter a little every time she looked into his. Like his gaze reset her brain and made her lose track of her words. Inferno's attention was drawn to the flames on Aviur's back. “I see you're feeling better now. I'm glad you didn't lose your awesome flaming spine thing.” She grinned at him, “you gotta show me what else you can do with your fire sometime. I never really thought of using it for any other reason than just blasting away my foes directly." As happy as Inferno seemed, there was still a hint of despair behind her eyes. Like she wanted to talk about everything and nothing all at the same time. Aside from how startled she was about her current feelings towards Aviur, she also couldn't stop thinking about Cor. About how the pain he'd inflicted on her would last for an eternity in her memory. For a brief second, her eyes darted to the amulet in her talon. Cor's amulet. The one that kept him alive. She'd thought about breaking it, but a part of her refused to. Now that she and Aviur were hovering above the buried Stone Haven, she enjoyed the thought of him being buried alive down there. Hope you enjoy suffocating, you miserable worm, Inferno thought darkly before returning her eyes back to Aviur's. She grinned, not realizing that she'd stopped after her flurry of unhappy thoughts. Aviur felt like he was flying. Well, he was, but he felt like he wasn't just hovering, that he was soaring through a crystal clear sky with the wind in his face. He didn't want to pull away, so when Inferno sharply broke the contact, he was.. Disappointed, to say the least. There was a fire in his belly that burned brighter then even his life source flames. "Hmm.." he hummed, gazing at her with glassy eyes. He was smiling like an idiot. To his shock, Inferno thanked him. Inferno? Thanking him? That was news to him. Aviur listened as she thanked him for saving her, shrugging innocently. He laughed when she hit him with her tail. "I-It was a spur of the moment type thing," he stammered, chuckling nervously. Then Inferno got onto the topic of his flames. Aviur looked over his shoulder at them and smiled. "Sorry to disappoint you," he said, returning his gaze to her. "But I can only use this babe when my life is in danger, or the life of another I care about. It can also.. Come on, when I get really, really upset or angry." he shrugged, chuckling. "So you'll have to wait till the next adventure to see it again. I don't wanna die from overuse," he said, grinning. He then smirked at her. "Of course.." he said, flexing a claw. "You coukd always kiss me again," he said, looking up at her through a raised eyebrow and a devilish smirk. He then laughed. "I'm joking." He then noticed she was looking at the amulet clutched tightly in her jaws. He caught it as she looked back up at him. "That's Cor's amulet, ain't it?" he said softly, meeting her eyes. When Aviur suggested she kiss him again, Inferno came close to striking him with her claw. I’m glad you’re joking, she thought, I don’t wanna have to claw your eyes out! Despite herself, the male dragonet’s flames were as interesting as they were mysterious. She wanted to know everything about them. How did he get such fire? Who taught him how to use it? Does anyone in his family have the same thing? There was a time and a place for everything, and at the moment, questions were unfortunately not appropriate right now. Inferno let out a sigh and held up the shining red amulet in her talon. Right now, she supposed that this had to be their focus. Perhaps the only thing that remained of the buried city. She laughed softly, returning her gaze to him once more. "Don't get me wrong, I'm perfectly capable of handling things myself. I just figured maybe, you know, two heads are better than one." 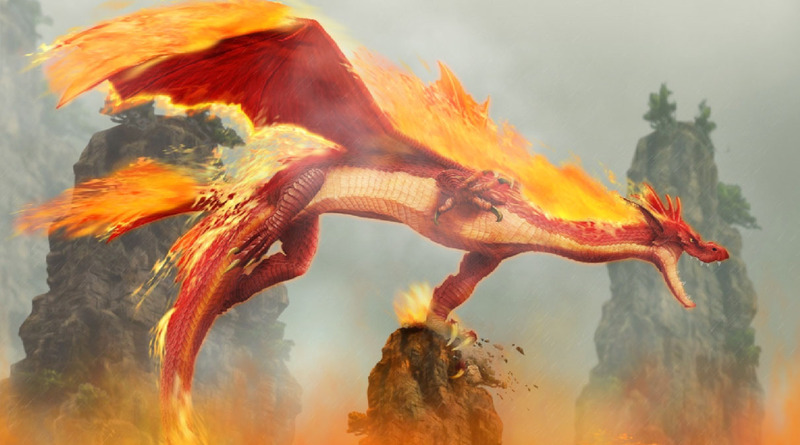 Aviur observed as Inferno held up the amulet, which was basically as red as any half-wit FireWing's scales. He met her eyes as she explained the reason for her having the amulet. Temur gave it to her? Interesting. He must trust them a lot, he suddenly thought, before mentally slapping himself. To be honest, the thought of suffocating for the rest of eternity was rather gruesome to Aviur, and made him a little sick, but Cor.. he was evil. A goddamnn evil dragon. To think of what he did to that female and her mate.. Suddenly, his punishment seemed too nice. Inferno's suggestion made Aviur grin. "Me too. I'm starving." he then paused. "Then again, I'm constantly hungry, so it's probably a good thing I don't get near lots of food that often," he chuckled, deciding to ignore the analogy. Aviur was about to open his mouth and yap about something stupid or irrelevant (probably both),but Inferno cleared her throat, and shut him up. Aviur listened to her speak, a slow smile appearing on his maw as a new wave of excitement washed over him. "Heck yeah! We could be like- Uh.. a pair of famous adventurers that I don't know the names of," he shrugged, before grinning. He released a short laugh as she added the part about her being able to handle herself. "Trust me, with my intelligence and your brawn, we can make quite a pair!" he joked. "Actually, you're more of the intelligence then me," he admitted, shrugging. He then did a quick 360 spin in the air, before looking at her again, smiling warmly. "Now, I'm starving. Let's go get something to eat before I start wondering what you taste like," he said. Inferno couldn’t deny the relief she felt in the pit of her stomach when Aviur agreed to go on more adventures with her. The brash dragoness’ imagination ran wild with thoughts about where they would go and what they would find. Most importantly, if these journeys were as harrowing as their time in Stone Haven, Inferno was sure she’d be ready for anything war could ever throw at her. As happy as she was that he’d spend more time with her, Aviur’s compliments fell on deaf ears. She simply scoffed in response. Me? The intelligence? Pah! Inferno thought, rolling her eyes. What kind of intelligent dragon can’t even read? Besides, force can solve just as much, if not more, than wit. Inferno stared at Aviur for a moment longer and tilted her head as he proceeded to do a spin. One of the many little stunts that he seemed prone to do once they’d been idle for an extended period of time. She was starting to take it as an indication that he was feeling a bit antsy and needed get a move on. His last few words about beginning to wonder what she tasted like sent a chill up her spine. She wouldn’t touch that statement with a one-hundred foot pole. “Infernoclaw!” Boomed a voice from behind the dragoness. She instinctively ducked her head down, looking a bit startled before turning around to see a large FireWing speeding straight toward the two of them. His scales made him look like Cor at a first glance, but Inferno knew it wasn’t him just by the sound of his voice. She’d heard that shout time and time again. It may not have been Cor, but it was definitely someone who was second on the list of dragons she didn’t want to see at the moment. With that, the dragoness turned and flew off to meet with her father.